Just when you thought everything had been ''revolutionized'', along comes a product that simply blows everything else out of the water! Starting with a clean slate, K&N built their Flow Control to work as a system. The filter base and lid are precisely contoured to smooth and direct the incoming air exactly where it needs to go. 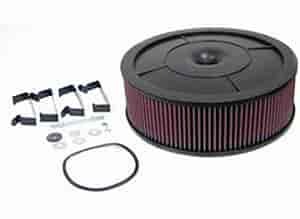 Each piece is engineered to work together in harmony, to create an air cleaner that does more than just sit on top of your carb. Includes filter, base, lid and all hold-down hardware.